SQL Server Management Studio – Outstanding UI provided by Microsoft for managing/Administering/Developing/manipulating code in (for) SQL Server environments. As a DBA how much time would you spend with SSMS on a daily basis? I would say 90-95%! Well, we will be using Configuration manager if needed sometimes to troubleshoot few things (Will be covered in another post). As a SQL Server Developer how much time would you spend in SSMS on a daily basis? I would say close to 100%. PS BI (Business Intelligence) developers spend more time in BIDS (Business intelligence development Studio). A Quick Question– How many of you explored all the features (at least few of the available features) in SSMS? Will the default settings of SSMS Installation suffice our daily requirements? Of course “Yes” in most of the cases. But I’m pretty sure, after reading this blog completely you’ll definitely try exploring those options (if you are not yet at that point). Okay! Now it’s time to explore…..
I’m assuming, you’ve got SSMS 2008 already installed on your machine(s) and you’ve a brief knowledge on why and how SSMS is used. I’ll explain few scenarios where most of us will find interesting. 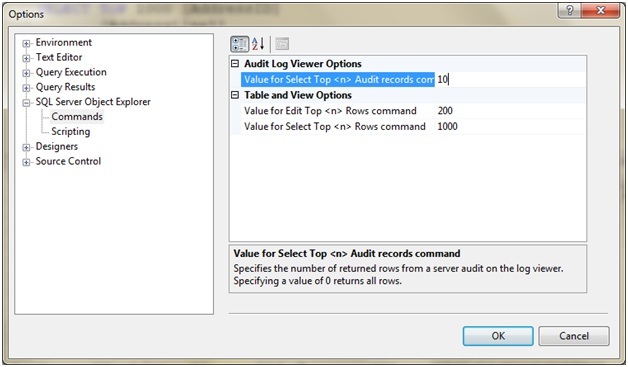 Scenario1: Selecting records using GUI. Most of the times we’ll be using these two options just to get a sample result set. So do we really need 1000 rows? How about changing it to 100 or even 10 Records? Cool huh! 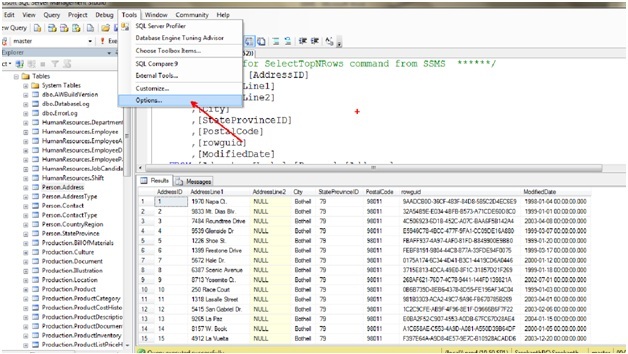 Go to Tools – Options – SQL Server Object Explorer – Commands. Change the default values at the right pane to the desired values. That’s all we’ve to do! 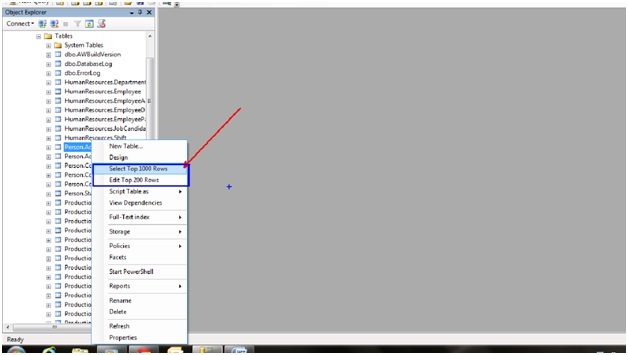 In this example, I’ve changed select value from 1000 to 10. Scenario 2:Have you ever felt including IF NOT EXISTS logic automatically whenever you script any Object out of your database. 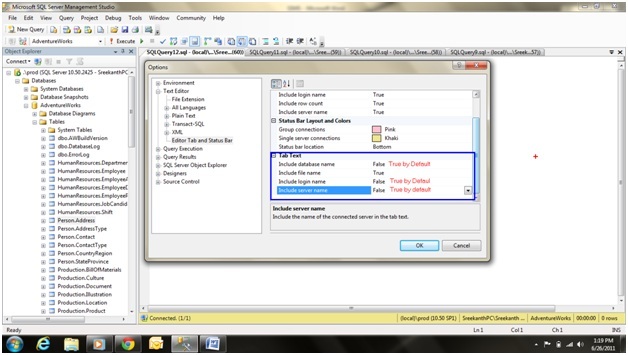 SSMS by default don’t do that, but we can change that setting as shown below. 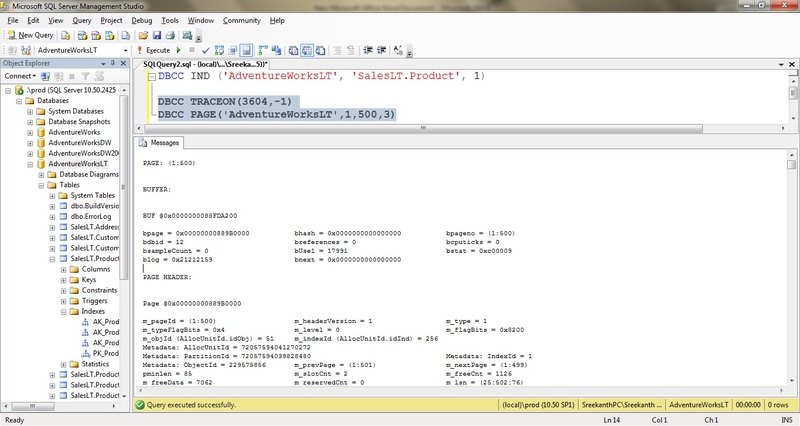 Now if we script an object in SSMS, it looks something similar to below code snippet. Play and get familiarized with rest of the scripting options which you are seeing in above screenshot. When editing your tables using SSMS. Let’s say you are adding a new column to your table in the middle. 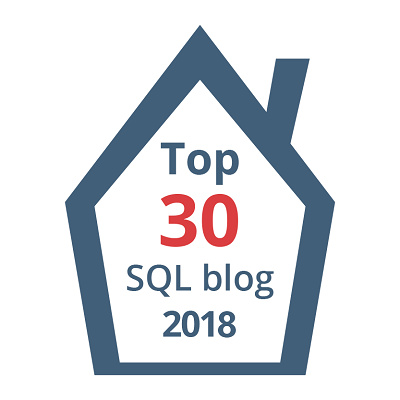 (Useless in most of the cases, since all it matters to SQL is the order how you pull your columns in your select statement.By default new column will be added at the end of table.) We’ve to do that by right clicking on table and selecting DESIGN. 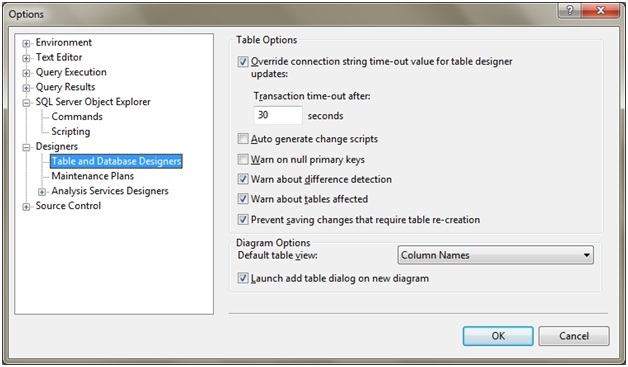 But SSMS won’t let us to do and it’ll throw an error because this change requires the table to be dropped in general. So what to do? Just un-check Prevent Changes that require table re-creation and that’s it! Go to books online for finding out all the changes that require table re-creation in SQL Server. 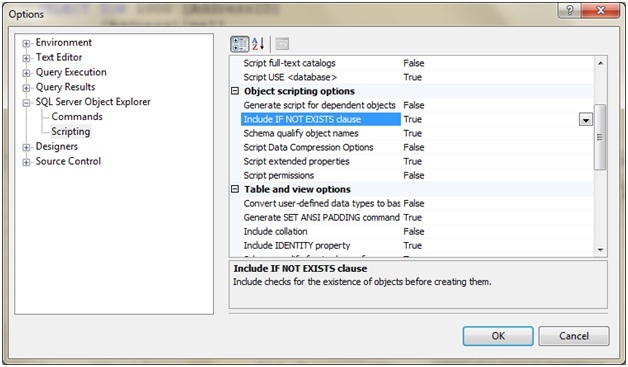 Caution:For huge tables, it may timeout and I’ve seen few cases where SSMS crashes. I recommend you to Script out changes (generate Script button on your top left while you are doing any change) and review code to look what SSMS is really doing for you behind the scenes instead of just clicking NEXT-NEXT-OK in your SSMS for making any table changes. Believe me, you’ll never regret doing so. 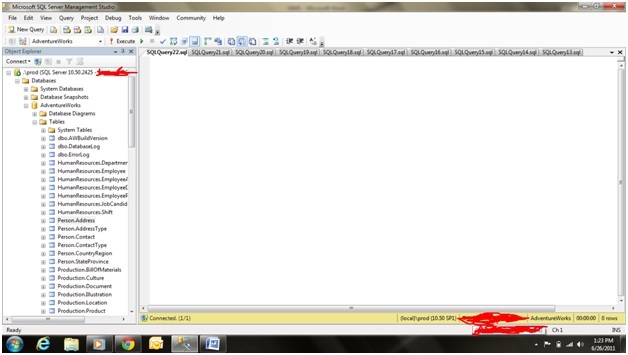 Scenario 4: Shortcut Keys in ur SSMS. 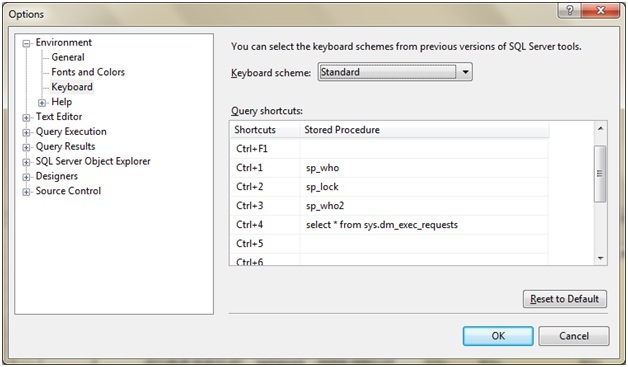 You can define your Queries as keyboard Shortcuts in SSMS as shown below. PS sp_who will be default for ctrl+1. 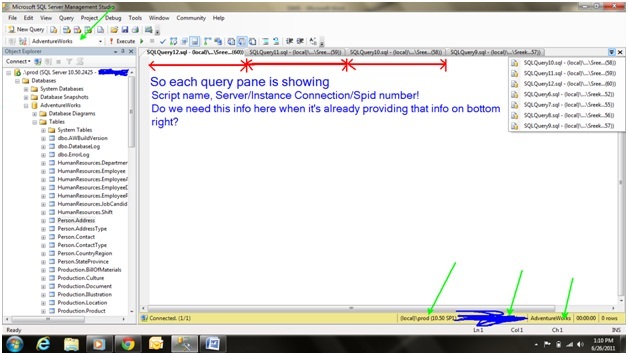 Scenario 5: Annoying tab width in Query Pane. Correction – that’s just SPID not SPID Number in above screenshot – forgive me,I’m not going to edit that screenshot now. So, how to decrease its width by removing all the unnecessary details provided by SSMS by default? Once I clicked OK, now you can see my SSMS accommodating more number of TABS. Today I’m going to give a brief about collecting Performance Monitoring metrics using Perfmon. ( For a better Picture of what exactly is happening with your SQL Server, you may need to use SQL Profiler along with Perfmon and Ofcourse you should consider using DMO’s(Dynamic management Objects) starting SQL Server 2005. As a DBA you must and Will use Perfmon if you want to gather Real Metrics on your Server(Both Physical and SQL Server). But if you are new to perfmon i’m sure that you’ll be confused with the number of counters and metrics it offers. Make sure to familiarize with atleast important counters which we as a DBA might need to capture your server health. Consider opening from your client machine or choose a DEV Server( ideally sitting in the same data center) and capture your production server metrics from there. Familiarize yourselves with scheduling counter logs and analyzing what it captured. What format to choose for your counter logs? You can leave it as default(BLG) and you can make use of PAL tool( It’s a free and fabulous tool for analyzing your Performance Logs). Please note Log Parser is a prerequisite to install PAL. Again, don’t install these tools on your Servers. Make use of your Client machine(s). CSV – if you are more into and addicted to Excel, you can save it to a CSV file and open it with Excel and slice and dice the results accordingly. ( you can go as fancy as you can with all Cool graphs and color coding and what not). Get familiar with Win Server 2003/2008/2008R2 as most of the shops out there are still running on Win Server 20003. Okay…enough blabbering and let’s get straight into the point. Memory – Page Faults/Sec – look for constant high numbers. That’s something which we don’t want. SQLServer: Buffer Manager – Page life expectancy – more the Number more better. 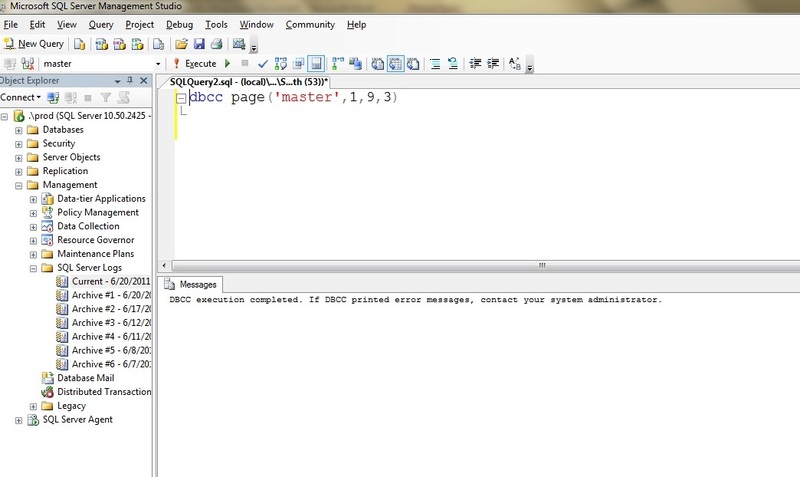 SQLServer: Buffer Manager – Page reads and Writes/Sec. Note – these are physical Reads not Logical Reads. SQLServer: Memory Manager – Memory Grants Pending – Sessions which are waiting for memory to be granted. This should be ideally close to Zero always. Physical Disk – Avg. Disk sec/Read and Write – The Avg. 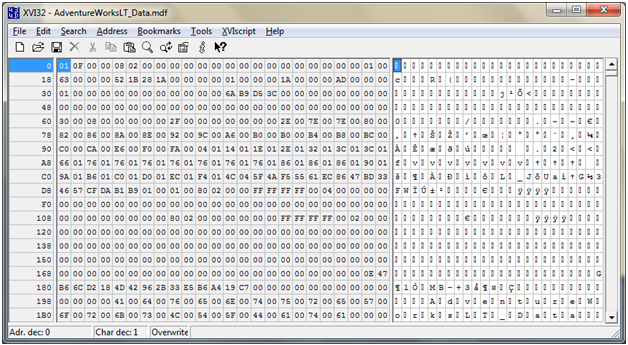 Disk sec/Read performance counter indicates the average time, in seconds, of a read of data from the disk. For example,Your perfmon says you have waits for disk reads/writes. Does this always mean that you need faster and more disks? A big screaming Noooo! It could be paging, So the real culprit is memory not your disks. Also, are your Disks DAS D’s or SAN D’s? Let me make something very clear, Windows designed Perfmon DISK metrics for your Direct Attached Storage not for your SAN Storage. Disk Queue Length will Vary….It actually depends on how Old/New your Drives are and also we should consider do we really know how many Disks are present in our array?? All the Modern days Drives will come with Read-Ahead/Rear-Behinds, which will increase Disk queue lengths which is really not a Problem. If we don’t have any regular Long durationIO Stalls in our SQL Server (we can find out using virtualfilestats DMO) we are fine! When executing a read from the disk, the disk arm moves the read/write to (or near) the correct track, and after some settling time the read head begins to pick up bits. Usually, the first sectors to be read are not the ones that have been requested by the operating system. The disk’s embedded computer typically saves these unrequested sectors in the disk buffer, in case the operating system requests them later. Disk Controllers, The disk buffer is usually quite small from 2 to 32 MB for most of the drives out there present in market. Disk Array Controllers, as opposed to Disk Controllers usually have normal cache memory of around 0.5 to 8 GB. Typically Perfmon Counters for Disk(s) are designed for DASD’s, not for SAN D’s. For SAN ideally we’ve to go with the Vendor provided Tool for monitoring. I personally feel monitoring the counters of sec/read and sec/write; Reads/Sec and Writes/Sec in Perfmon and the IO stalls by virtualfilestats DMO in SQL server would give us a much better picture of DISKS(especially in the present days of SAN). 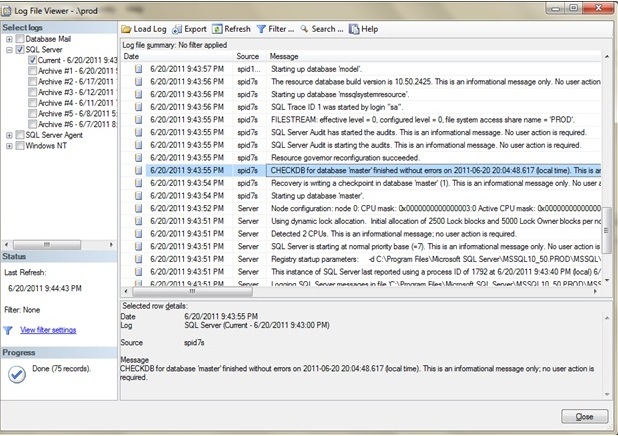 Couple of days ago, one of my colleagues observed in the error logs saying, “CHECKDB for database Completed on the database(s) blabla” when she restarted SQL Server Services and she asked me how come SQL Server is running Checkdb within matter of seconds when SQL Services are restarted where as it takes hours and hours when we run Manual CheckDB’s?? (FYI few of our Databases are 450 +GB in size on this Instance). I really had no answer at that moment? After refreshing my mind, I recalled the statement of P Randal saying theirs is nothing in SQL Server which automatically runs CHECKDB for you and Crash recovery of SQL Server won’t run DBCC CHECKDB. Well, So..this made me to research a little bit further on what’s really happening behind the scenes! Before going any further I want to say a little bit about Boot Page. So, why did I mention about Boot page first of all? Coz…that’s the place where you can find the information regarding when was the last clean DBCC ran against your database. But how to look at that? Using DBCC PAGE. I’ll check on my Master Database. Well, It returned nothing! You’ve to enable traceflag 3604 to dump the results to your results pane or 3605 to dump results to your error log. so it’s saying dbi_dbcclastknowngood = 2011-06-20 20:04:48.617. If you are not comfortable with DBCC PAGE, you can make use of DBCC DBINFO(‘database’). Please note, even this requires traceflag 3604/3605 to be enabled. If you want to get the results in a tabular format, you can make use of WITH TABLERESULTS. Now, I’ve restarted my SQL Server and let’s see what’s there in our Error Logs. 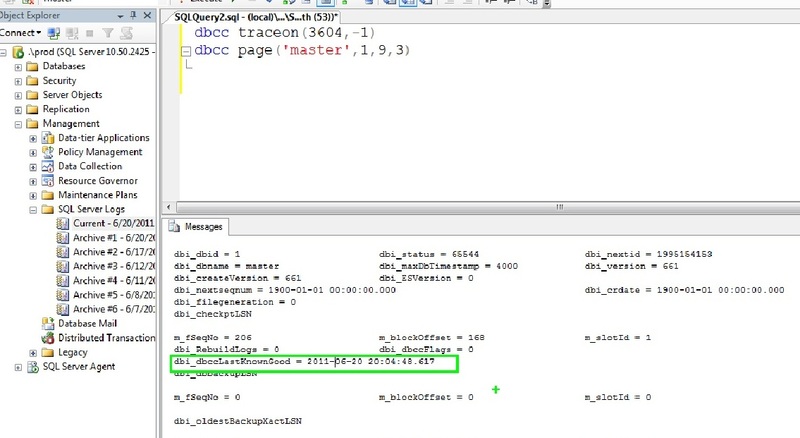 If you see it thoroughly it’s basically saying that DBCC was last ran on master database at 2011-06-20 20:04:48.617 but not at the current time when I restarted SQL Server. SQL is pulling that information from Boot Page of the respective database. So. I learnt a lesson that we’ve to keep a very close eye on the Date and Time in error log besides the content, which we ignore very often for informational messages! Note: DBCC PAGE, DBINFO and TABLERESULTS are undocumented commands. If you are not comfortable using them, please don’t use them on your SQL Servers.